I’m reading Sarah Vowell‘s book Unfamiliar Fishes which was recommended to me by a college friend. He and his wife (also a college friend) and daughter spent the weekend with us at Bonnaroo. The book is a brief history of the evangelization and annexation of Hawaii and its eventual adoption as a state. I haven’t read or even heard of Vowell before but she’s evidently on the Daily Show a good bit and also on NPR. I love the way she writes (very dry sarcastic humor as well as very interesting historian). Mills, Dwight, and the other men of faith who founded the [American Board of Commissioners for Foreign Missions] would use the empirical data and maps of European explorers like Cook and LaPerouse to fan out evangelists across the Pacific to spread the fear of God as far and wide as Cook’s men had spread the clap. In New York, Obookiah disembarked with Thomas Hopu, a Hawaiian shipmate he had met on board. As the missionary Hiram Bingham described their first night in Manhattan, “Like the mass of foreign seamen who then visited our cities without being improved in their morals, [they] were for a time exposed to the evil of being confirmed in vice and ignorance, and in utter contempt of the claims of Christianity.” That is how a missionary describes the fact that the Hawaiians went to the theater. 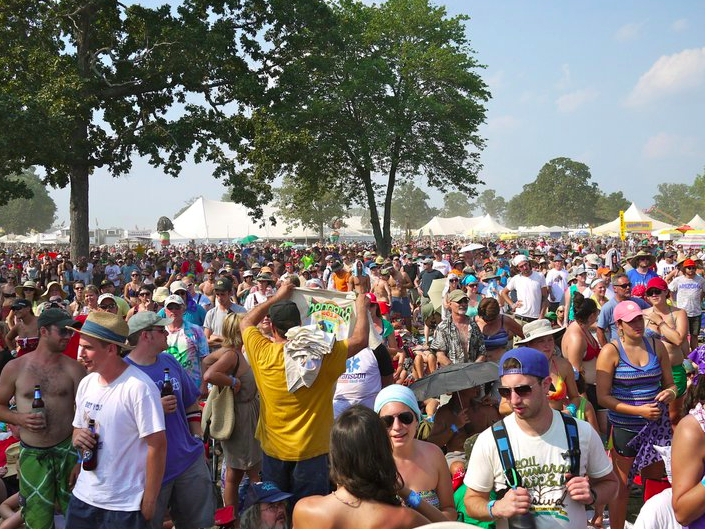 So…I found myself at Bonnaroo this past weekend. On Saturday, I drove by some descendants of the very missionaries who had “spread the fear of God as far and wide as Cook’s men had spread the clap.” I was heading home for a “real” shower and these missionaries were heading into Bonnaroo dragging crosses and [what I assumed to be] King James Bibles and sandwich signs condemning the satanic rock-n-roll being spewed out of Satan’s Hell there on that little farm in Manchester, TN. Upon my return, my camp-mates confirmed my fears and recounted their experiences of being preached at. Later that afternoon, we found ourselves at the Mumford and Sons show at the Which Stage along with 50,000+ others who were drawn to their sincere and fresh brand of folky rock-n-roll. What we witnessed was a group of very serious lyricists who were almost uncomfortably humbled by the prospects of performing for such a crowd. They returned for an encore with a good number of musician friends and led the gathered throng in a deeply moving and spiritual rendition of Amazing Grace. I saw one young woman projected on the video screen beside the stage weeping. As a follower of Jesus, I absolutely sensed God moving among those people. And I was at church. More precisely, I was with the Church. Meanwhile, those other more obvious followers of Jesus were driving people away from Christ with their brand of condemnation and hate completely missing the gospel being proclaimed by some of the very profane musicians they were denouncing. How do we (the church claiming the name of Jesus) totally fail to “get it”? It’s very easy for me to cast stones at this judgmental and hateful brand of religion. But, upon reflection, I need to try to recognize when I’m guilty of the same in the name of my own particular brand of “absolute truth”. That’s what I’ve been thinking about this morning… Peace!